Food for body, and for the spirit. I’ve had an indolent–well, honestly let’s say lazy, slothful, shiftless, do-nothing morning. This entails sitting on my deck watching the Brown-headed Nuthatches, Downy Woodpeckers, and Carolina Chickadees (all fledglings in various stages of do-it-yourself development) with parents occasionally feeding them while they flit about and practice eating and perching. (I’m taking lessons from Frankie, the cat, on relaxation. 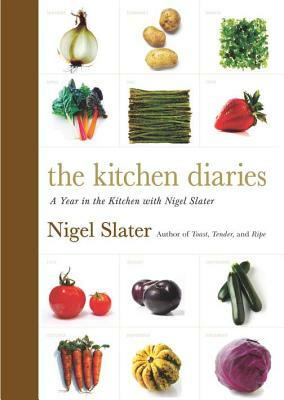 )Between hefting the binoculars and sipping café au lait, I’ve been perusing Nigel Slater’s The Kitchen Diaries. If you like to eat good food, this is a book that you should at least check out of the library and read. After reading one of his other books, I bought it (hard copy, not Kindle). I suspect that it’s a book that will never make it onto the bookcase shelf–rather it will wander from living room, to bedside table, to kitchen table, to the office, and back again, to be picked up and read for any number of reasons–fun and inspiration included. In just a brief perusal, it’s gone to very close to the top of my favorite food books, right up there with M.F.K. Fisher’s The Art of Eating and Roy Andries de Groot’s In Search of the Perfect Meal (contents selected by Lorna J. Sass). This is food for the spirit, the kind of recipes that lead to improvisation–no long lists of ingredients, no really complicated techniques; just a remarkable reverence for excellent quality seasonal ingredients–be it fruit, vegetable, or animal, prepared with a love of good food and appreciation of nature. It is imbued with a sense of appreciation for food–not all of it actually cooked for a sit-down meal. The author recognizes something that all of us who cook and put “leftovers” in the refrigerator do–grazing–with the same appreciation, given the appropriate circumstances, for food, even when grazing. Nigel Slater has a wonderful writing style–easy to read, but full of food for thought with a great turn of phase (British to the Nth degree). Recipe instructions are clear, and concise; grazing and casual creations are often to be found “buried” in a paragraph, which makes a delightful discovery as you read–a bit like a treasure hunt! (There is an index as well where you can find recipes, or just read through to see what’s available–I know, I do have a “thing” about indexes–I sometimes actually read them!). Don’t misunderstand, the recipes here are not what you’re likely to find in Gourmet or Bon Appetite. This is food that isn’t architecture, and doesn’t look as if it’s “too good to eat”. It’s not a creation, or restaurant food–it’s comfort for both the body and for the soul.